wasn’t enough for Russia’s Marx-inspired revolutionaries (more about Marxism in a separate e-mail that will come to you some time this week). A revolution in 1905 failed but led to the institution of an elected parliament, the “Duma.” In February 1917, while the Russian Army struggled in World War I, revolutionaries overthrew Tsar Nicholas; in October of 1917 — the infamous October Revolution — Vladimir Lenin led the Bolsheviks to power, birthed the world’s first socialist nation and signed the Treaty of Brest-Litovsk with Germany, ending Russia’s role in World War I.
Stalin died in 1953 (of a stroke? was he poisoned? ), and Nikita Krushchev came to power, ushering in a less repressive — still repressive, but less repressive — Soviet leadership. He even dared criticize Stalin, which conservative Communists wouldn’t permit. A party coup overthrew him in 1964 and he died of natural causes (?) in 1971. For the next twenty years, most of them under the rule of not-outwardly-fun-guy Leonid Brezhnev Russia’s economy and society stagnated. 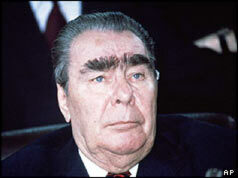 After Brezhnev’s death in 1982 and a few years of other leaders, Mikhail Gorbachev came to power. Gorbachev sought to modernize and even democratize the Soviet Union by instituting glasnost (social openness) and perestroika (economic restructuring). The USSR did open and restructure, but not the way most in the Soviet leadership wanted. Nationalist and separatist movements sprung up across the nation. (More about the many different nationalist and ethnic groups will come in a different e-mail.) One by one the Soviet-sphere nations, many of which we’ll explore during this session, distanced themselves from the Kremlin. The Soviet economy crumbled. In August 1991 hard-line Communists staged a coup to wrest power from Gorbachev and reestablish Communist control. The coup failed, and the country became less and less stable; the USSR dissolved in December 1991. Russia became “the Russian Federation” and was one of the 11 former Soviet Republics that joined in a loose confederation to became the Commonwealth of Independent States.